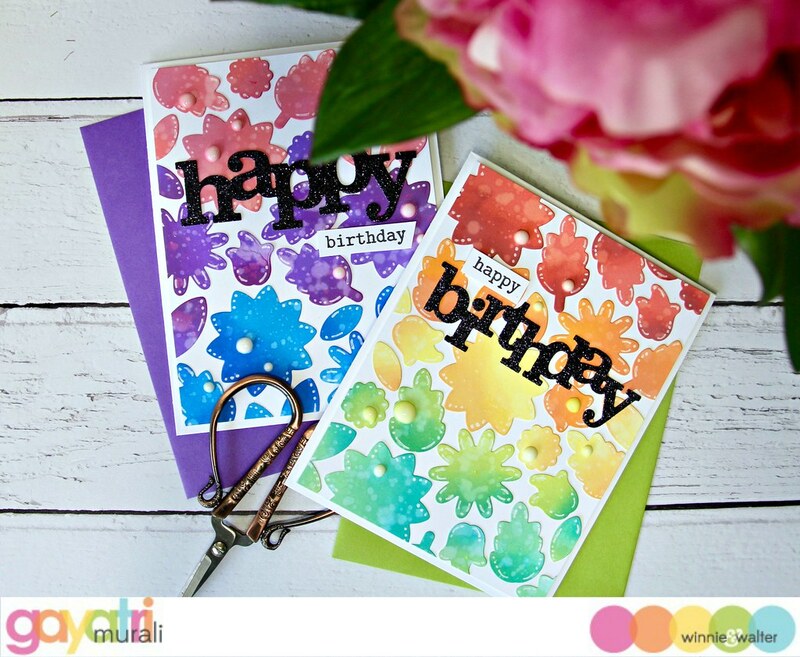 Warm and Cool Birthday cards! Hope you had a lovely weekend. I certainly had a relaxing weekend. Got back into craft after a minor finger injury. So I have a set of cards to share with you just using W&W’s Cutaways. I actually started with the intention of making just one card. I got carried away and made lots of elements that I ended up making two cards and plenty of die cuts left over as well. 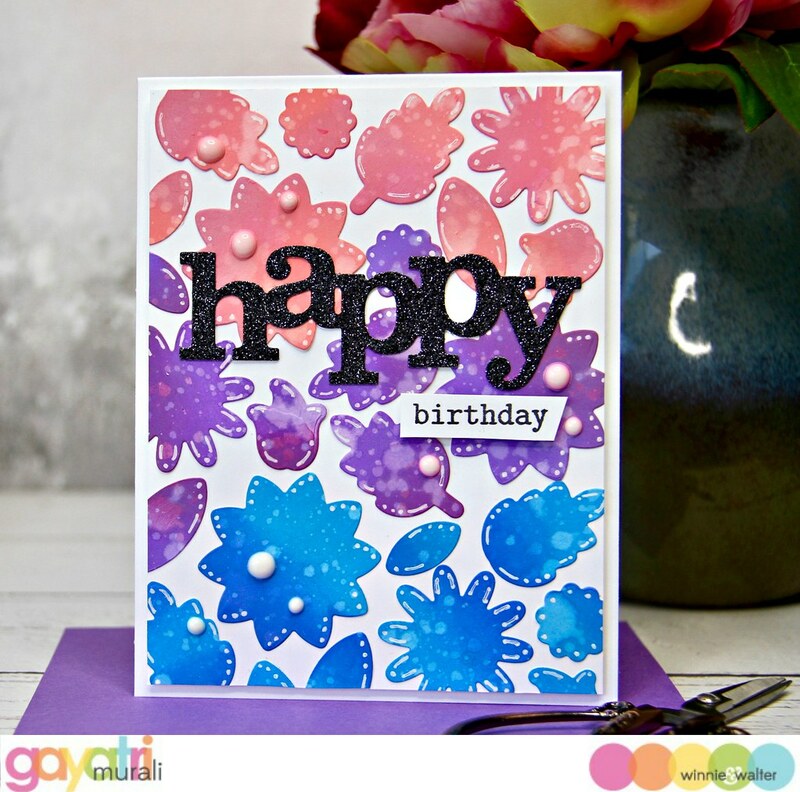 I love the large floral dies from the In Bloom: Eva’s Favorite Flowers Cutaways. 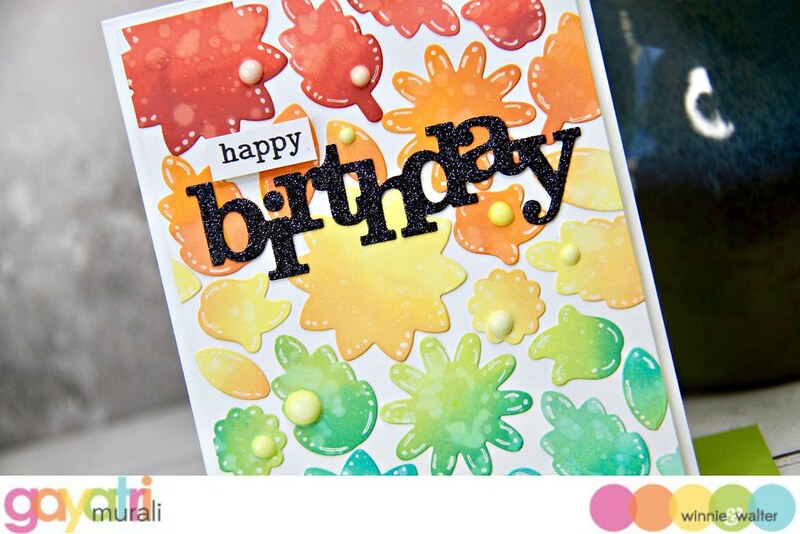 I wanted to use the dies on its own and spruce the die cuts to create colourful background. So I sponged four white panels with Worn Lipstick, Abandoned Coral, Cracked Pistachio, Carved Pumpkin, Squeezed Lemonade, Salty Ocean and Wilted Violet distress oxide inks. So each panel has two colours each. Then I used just a few of the dies from In Bloom: Eva’s Favorite Flowers cutaways to die cut through all the panels. I now have six coloured sets of the same die cuts to use. To spruce them, I sponged a darker colour of each colour to one side of each die cut to add a bit of depth. The colours I used are Candied Apple, Peacock Feathers, Picked Raspberry, Lucky Clover, Wild Honey, Spiced Marmalade, Blueprint Sketch and Seedless Preserve distress oxide inks. 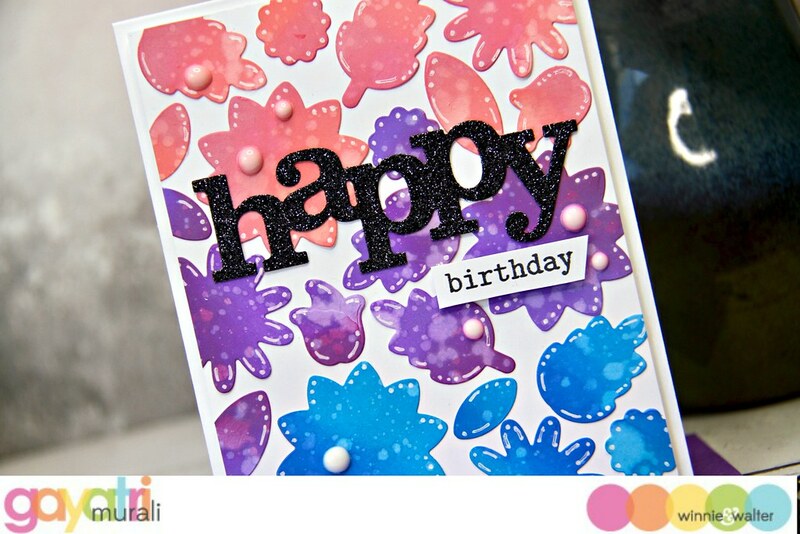 Then used white gel pen to add details to each of the die cut. Then I glued the die cuts on to two white panels trimmed to 4”x5.25”. On one panel I used all the warm coloured die cuts and on the other I used all the cool coloured die cuts. So I have two panels to make two cards. I adhered the panel on white card base using foam adhesives. For the sentiment I used In a Word: Happy and Birthday Cutaways. I die cut them using black glitter cardstock and adhered directly on the background panels. 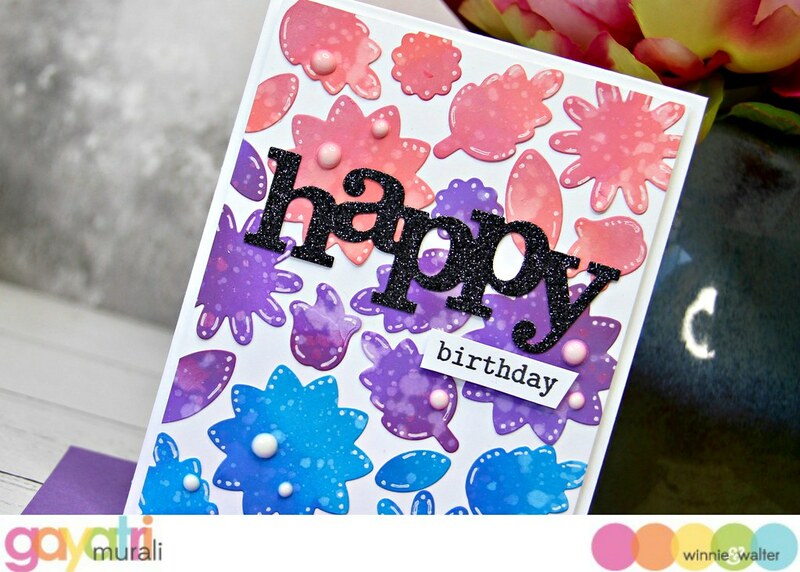 The secondary sentiment is from the The Big, the Bold and Party stamp set. 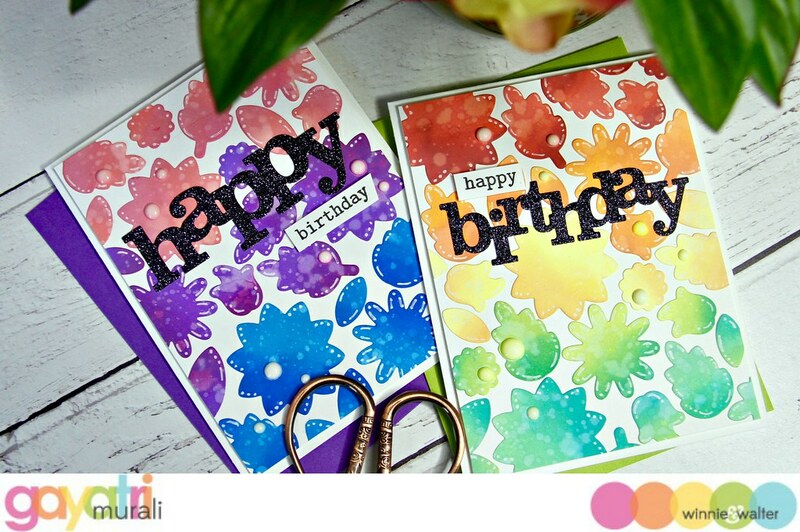 I stamped them using black ink on a white strip of cardstock, trimmed and adhered using foam adhesives. Finally, I added white Nuvo Crystal Drops to finish up the cards. The white drops picked up some colour from the die cuts on the edges. It looks so cool. I love it. Here are the photos of the cards individually and closeups. No stamping at all. Just using Cutaways to make a set of two cards. Something different to try right? 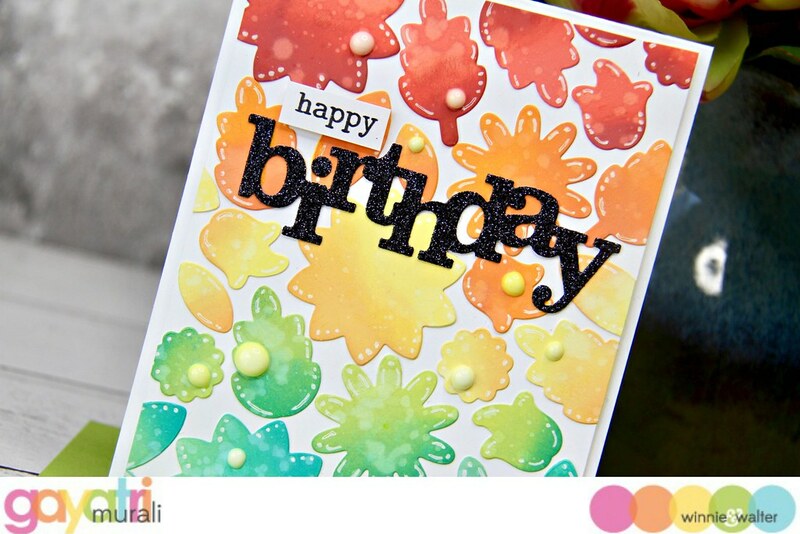 If you make a card using this technique, share it on social media and tag us. 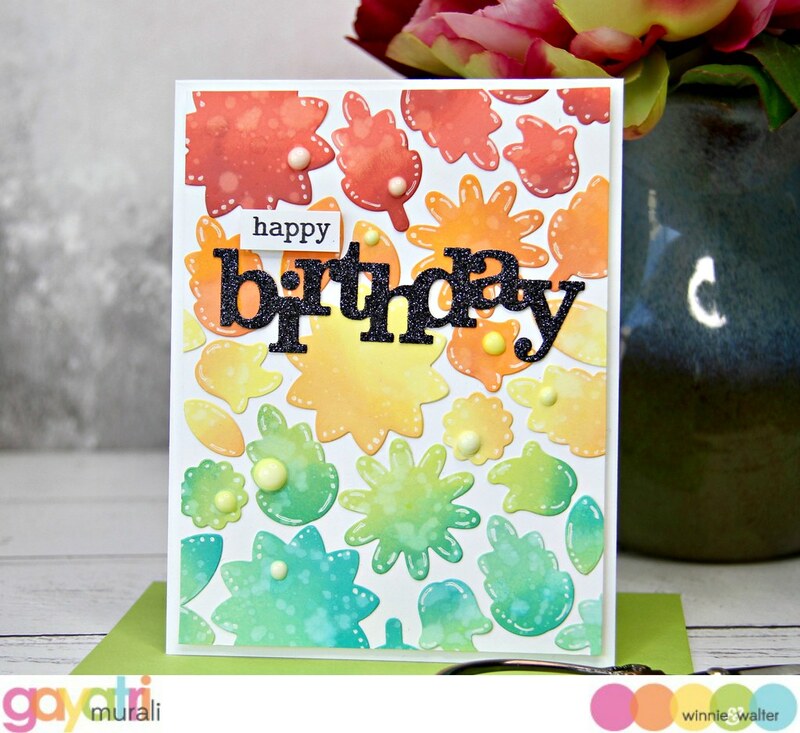 All supplies used to make this card are listed below. I love the colors, the cards turned out beautifully.